Great for my 12 year old and 8 year old. Plenty of room for them and one or two friends. My kids jump on it every day. It did come in two boxes which surprised me but easily assembled with two people. 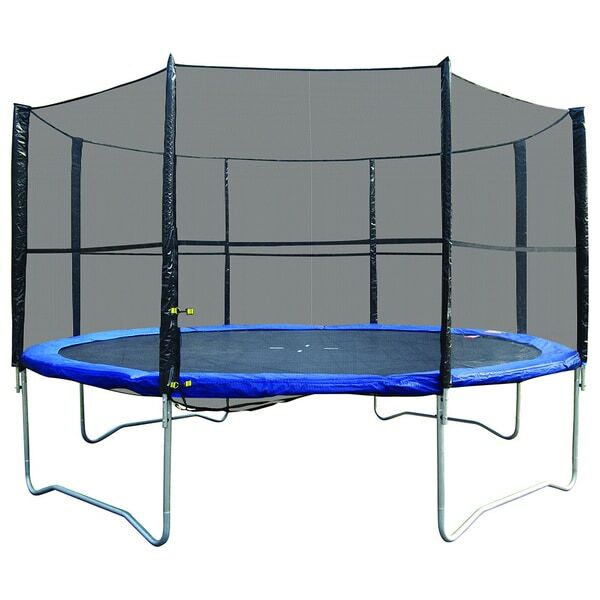 Encourage adventure in a safe setting with this trampoline combo complete with a safety net. Stay in shape while showing off your flips and balance with this trampoline designed for ages 10 and up. I purchased this a little over a month ago, and as I expected my children love it. Because it's now out there in the backyard and the kiddo's like to jump a lot, it's forced my wife and I to be outdoors more; which is a good thing, because it’s more family time. While the kids jump around, I throw some meat on the grill, and make it an outdoor thing. The safety net is what made me choose this one, because it keeps my toddlers from falling out and hurting themselves. The zipper that closes it keeps my four and five-year-old inside, so they have to ask for someone to let them out; which keeps them once again from falling. The icing on the cake is the protective pad that goes around the springs keep my wife worrying herself half to death about accidents. This is the perfect trampoline, and the price is lower than the ones that I saw in the stores. I really look forward to my family using this for years to come. Excellent price! Good quality merchandise! My grandchildren loves trampoline. Just what we were looking for. Bought for 6 year old. Very fast delivery. Fairly easy to assemble. We put the net on the posts before putting up as suggested by another reviewer, worked great. We recently moved and was bummed about leaving our old trampoline behind. So, I bought this one to add a positive to our new home in an unfamilar area. What a hit!!! My children and I are so happy with this purchase. My son is making multiple visits outside rather than sneaking extra time on his computer to play games. The quality of this trampoline is so much better from a previous purchase from Wally World. I jump on it too. I had the trampoline assembled by someone other than myself. It took one person about three hours to complete. Thank you for supplying your customers with this priced right and great quality trampoline. Easy set up. Fun for all ages. The kids love it! Came as expected. Had it assembled quickly, and the safety net is a must have! So this came yesterday, and the hubby went to set it up. It's still not fully set up :/ I have to go out and put the pad on around the springs because he was not able to. It wasn't matching up etc. I'm hoping that once I get that done, the safety net will be a breeze for him to put up and the kids can go play! They are pretty sad they haven't been able to use it yet. bought it for my grand kids, boy did i make a home run! Great Tramp! Got this 2 years ago and it has held up well with my kids. There is some damage on the netting from my kids hanging on it. That's normal. Kids destroy everything! My kids love it! I would highly recommend . The two boxes were delivered in a timely fashion. They were here way more quickly than I thought they would be. The boxes are a bit heavy, as you would expect, so either a couple of people or a dolley needed to put them where you need them to be for set up. The set up was around average for what other reviewers have said, and the kiddos love it. Just as described! My kids love this trampoline. I have had it for a full year now and it stands as it did the first day. Good quality materials were surely used to make this one. Purchased this for my grandchildren. It had great reviews.the price was great for a 14 foot trampoline with net. I purchased a ladder just for to get on. "So this does comes with the extra padding to put over the springs so no toes get hurt? I noticed they are available to order separately? Sons birthday on the 20th, hoping to receive in time. Anything else to be aware of? Thanks for the feedback! Better to be prepared!" Unfortunately, the pad is not included. "Are the springs on the inside or outside of the safety net?" The springs are on the inside of the safety net and underneath the blue padding. "How tall is from floor to the mat?" The height will be 35 inch. "Does it come with the ladder?" No. However, we could not be happier with this trampoline. Excellent. "what are the weight limits to safely jump"
Unfortunately, information regarding the weight capacity is currently unavailable. We apologize for any inconvience. A simple Google search can tell you (and this is aimed at Overstock folks who "answered" your question) that it's 330 lbs. It's listed right there on **** site, so I don't understand why they couldn't answer that for you; hope it helps! Can it hold an adult with two children at the same time?